WHY STARTING TO ADD WEIGHTS TO YOUR CALISTHENICS ROUTINES?! What’s up, what’s up! Welcome back fam! Here we are, talking about a topic of course Calisthenics-related, that has been growing the interest and attracting more and more athletes worldwide: weighted Calisthenics! Well, let me just start this article by saying that, if you wanna give a shake to your workouts because you feel a little bored of the same isometrics/dynamics or because you have reached a plateau, you might wanna consider adding a bit more volume into them and get stronger than ever! The principle of introducing weights into your typical Calisthenics routines comes from the fact that, as most of you already know, provides your body with a new stimulus that can fix many issues you might encounter during your journey. It helps increasing the muscle mass (in case your goal could be of such kind), helps strengthening tendons, ligaments and provides explosiveness to your moves. If you have been struggling to succeed for instance in increasing the total amount of reps of the most basic exercises such as pull-ups, push-ups, dips and later on eventually muscle-ups, in order to avoid the above-mentioned plateaus, the thought of adding weights can help you developing much more strength and explosiveness! It can lead you to get far better at all of them and personally, I feel like sharing with you this little consideration I wanna make. Just to give you more proofs of this concept, after finishing my monthly cycle of strength, I immediately noticed the difference in performing muscle-ups with much more explosiveness, that before I didn’t have, as well as feeling my shoulders much stronger while holding a straddle planche or human flag for instance. 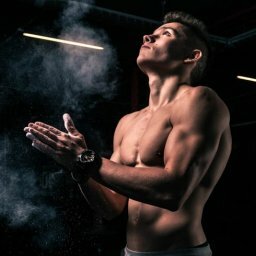 This is also a proof of fact that, all the main skills in Calisthenics don’t need to be trained strictly through progressions and propaedeutics, but also through new stimuluses that, like in this case of adding weights to basic exercises, are helping to build a solid strength also for the skills. Let’s say to close this little intro, that for sure a combination of both training methods, hence through progressions/propaedeutics for each skill as well as periodical cycles of strength that are implying to use also weights, is a very effective mix that can lead to awesome results. Of course, you must pay attention to the way you distribute such workout load in the period, so to avoid overtraining or unwanted aches and pains in your tendons and ligaments. As I mentioned above, before going into weighted Calisthenics, always for the same principle that lies beneath it that is for the sake of your tendons and ligaments, it’s highly suggested not to start including weights until you have prepared them in proper way so to bear the new loads you are going to provide them with. If you think of adding for instance 10 kg plate or 12 kg kettlebell around your waist and start performing chin-ups/pull-ups, when without you are still struggling to perform in a row and in clean form at least 10-15 reps, this kind of work is totally counterproductive. Why?! Because for the sake of your tendons and ligaments, you wanna make sure to provide them with a proper conditioning prior to adding whichever weight while performing those specific basic exercises. For sure, we all have different goals and different mindsets, but personally since I always wanna make sure to preserve the health of my body, hence tendons, ligaments and joints, I started adding weights to the basic exercises only after some time I had mastered already in correct and safe way all of them. Even once I started to add weights around my waist, I always made and I still make sure to provide a progressive and proper overload so to adapt the C.N.S. with a new stimulus after identifying the previous one as “non-threatening”. On a general basis, I can say that I prefer to work monthly and periodically (hence not every month) on stimulating muscles and C.N.S. with new progressive loads since I wanna make sure to give them a proper rest, before attempting any new increase. Of course, we all have different genetics and body structure for whose, some of you might be able to increase the load on a wider scale than somebody else, but still I invite you to consider preserving your body’s health, by not giving a too sudden shock in such terms. When I talk about calisthenics basics, I’m talking about what I consider being the fundamental elements of such discipline like for every other sport. Ya’ll know that, if you master in perfect way such motor patterns, the game gets definitely better and somehow easier under some aspects. From my point of view, the main reason why you should get very good at them is just for a matter of safety, self-confidence and awareness. If I know, that I’m capable of performing at least 15-20 reps in clean form of Australian chin-ups and pull-ups in their full form, hence with legs straight and eventually also on an elevated surface and in all their different grips’ variations, I’d feel quite confident then in order to attempt the very first reps hanging on a bar. The reason is that, without having anymore to worry about a possible lack of strength (of course then on the bar, I can always add as assistance the loop bands) I can focus better on form and technique and do each rep cleaner. Even in such preliminary phase, when you are still performing Australian chin-ups/pull-ups, the concept of adding some weight and make them more challenging is definitely a very good idea! If you had for different reasons, a sensible loss of strength due to a flu or an injury or simply because of a too long break from your workouts, you might wanna consider not jumping straight into what you were capable of doing before such events, but take a step back to the basics for a while (1-2 weeks). In this way, you’ll help tendons, ligaments and muscles to recover and get back to their previous shape and so never forget about training the basics also in such case. Of course, you would want firstly to increase the volume and so perform maybe 15-20 reps (high buffer) each set so to gain what you lost and when you start feeling that you’re getting back into shape, you can then add weight in order to give a final shock to your muscles and go back on track the week after. Depending on the age, the recovering time is different and so it is the one needed to get back to the strength you had prior to that flu/injury/long break. 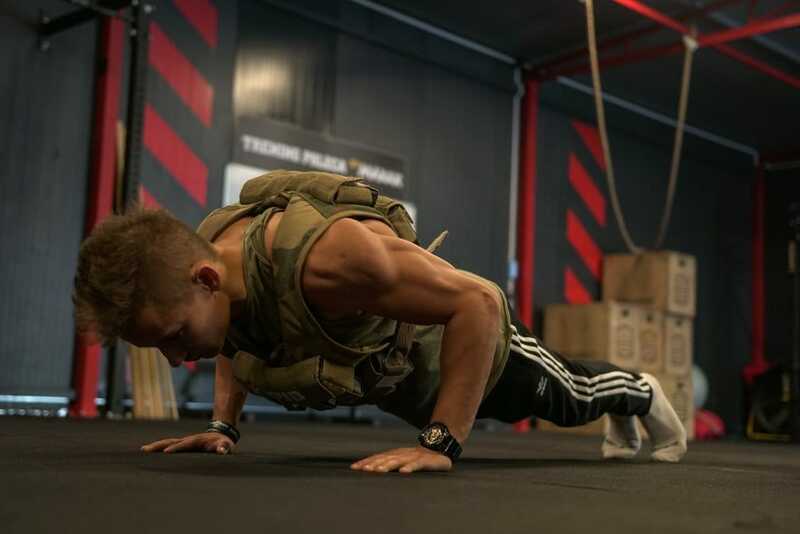 1) WEIGHTED VEST: probably one of the most comfortable item you can consider buying for personal purposes so to be able to carry it with you wherever you go and not be worried about finding a gym that is properly well equipped also in such sense. On Amazon as well as on E-Bay you can find a wide range of different brands and prices, so you can surely find the one best suitable for your needs. 2) DIP BELT: another very common and older “tool” used often at the gym to carry different loads by means of plates/discs so to vary instantly the total weight set by set. Compared to the weighted vest, for sure is not as much as versatile as this last one, since you would have to carry all the discs/plates if you plan to train outdoor in a park. 3) ANKLE WEIGHTS: less common to be seen in Calisthenics, but for some specific trainings they might come in handy. 4) LOOP BANDS: don’t forget about the incredible versatility of loop bands while training Calisthenics. Loop bands a.k.a. resistance bands, are a great replacement tool when, for different reasons, you might not have access to a weighted vest or a dip belt with discs. Think of them as a valid opposite force you add to the usual exercise/movement you perform; the most evident and immediate result you can get it while performing push-ups, dips or bodyweight squats and deadlifts. 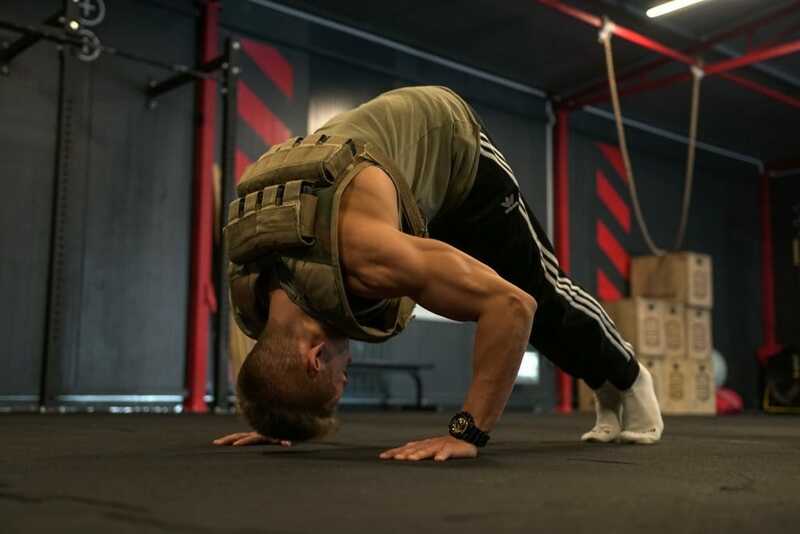 Also for training some skills such as planche, especially in the earlier progressions like tuck/advanced tuck planche or pseudo planche push-ups (ppp). 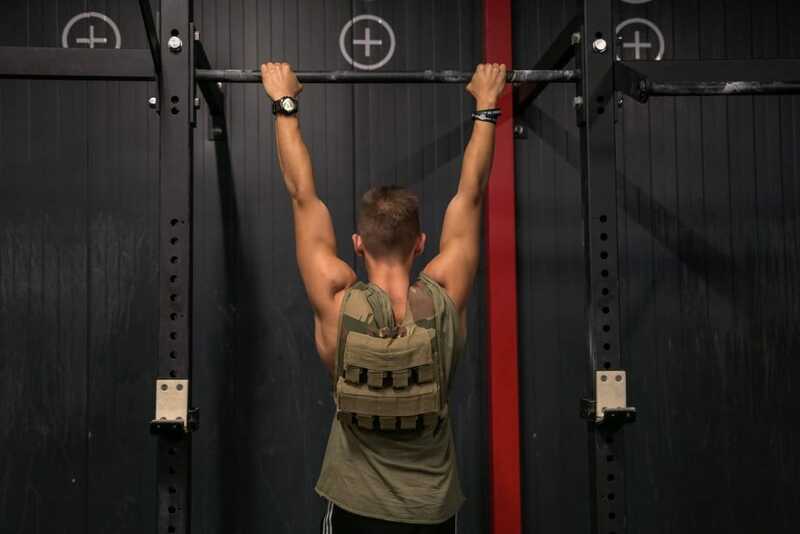 For pull-ups, loop bands can represent a valid opposite force as well, only you have to make sure to fix the band to a solid base so to put your feet in it before starting the pulling movement and in this way you’ll increase the resistance opposed during the concentric phase. Same principle can be applied also to Muscle-Ups so, as you can see, the versatility they have is here fully explained and proven and you just have to test it on yourself. Given this little intro to the weighted Calisthenics journey, we are going to talk about pros and cons of applying weights into your bodyweight workouts and provide you also with some of the most common and effective routines you can test, in order to start working with weights. IT COMES FROM THE THINGS YOU ONCE THOUGHT YOU COULDN’T!